Trashed Osprey. Not a photoshop, not an April Fool, and most importantly, not some one-of-a-kind pic from like five years ago just to make a point. This was today in Forked River, captured by the great Bev Morris who shared it. Sadly, you can get shots like this every day in Barnegat Bay. For example, I just spent an hour digitally removing a three foot piece of plastic currently tied to our very own Wendy the Osprey’s leg. I took the pic today. It’s for a magazine and I don’t want to show the world how gross our Island really is! I lack education, I like to pretend to hold opinions I don’t actually hold, I’m deeply paranoid, and I bore easily. Therefore, I try to steer clear of politics. So while I don’t know anything about the politics of banning single use plastic bags in Long Beach Township, I do have something to say about the plastic itself. I keep reading and hearing about the ban, and all of the things I hear and read seem to have been written on another planet. Or at least somewhere far away. On the political level people generally seem to treat this correctly as a local issue. But in terms of the actual problem of single-use plastic bags in the marine environment, people tend to address it as some huge, distant, impossible global issue. Which it is. But more importantly to us is that the problem of plastic in the marine environment is an undeniably local issue with local causes, local effects, and local consequences. It only just recently occurred to me that people are missing the true local carnage because they aren’t spending enough time out in the Bay and its marsh areas. I can’t tell you about the politics but I can tell you, firsthand, that the Bay is getting more choked with plastic every year. It used to be an annoyance. It is now reaching the level of “disgusting.” You don’t need to go global on this one. Osprey are choking on our very own, local, single use plastic bags, right in our own backyard. This winter someone wrote a letter to the Sandpaper, furious about the ban. The author said two things which showed that me people are literally not seeing the real problem. First, he said something along-the-lines-of “how come I don’t see plastic bags lying around my street if this is such a problem.” Apparently he has never seen the Academy Award (TM) winning American Beauty and its iconic scene, “The Most Beautiful Thing I’ve Ever Filmed.” Also, he apparently does not get outdoors enough, which I totally understand. So I’ll answer this directly: you don’t see single use plastic bags lying around the street because they blow away into the Bay in a matter of minutes. If you want to see them, you simply need to go to any marsh area in Barnegat Bay. There you will find them. Our Osprey nests are full of them. It’s really lame, and really disgusting, and it is getting worse every year. And now it is so bad, you can see our Osprey wearing them like coats. Anyone who isn’t seeing them should stop looking at the Island’s pavement and turn their eyes towards its wildlife. I’m not trying to be a wiseguy here. I am honestly coming to the realization that people don’t see the problem because they don’t get out to what are supposed to be our “unspoiled spaces” which are the heart of the coast and the massive economy which depends on it. Next the letter’s author rallied in defense of the hypothetical poor woman working in the single-use-plastic-bag-making factory and her job. He asks, What about this poor woman losing her bag-making job? Maybe I’m selfish, but that is certainly not my first thought. I’m worried about our jobs. Long Beach Island is doomed without a healthy, gorgeous Barnegat Bay. Sadly, the Bay is getting grosser each year and that’s going to be bad for business. Gone are the days when cheap, drunk, party goers were willing to overlook trash and sewage to get their Shore on. The future, and even present, success of this Island is 100% dependent on a healthy, local ecology. A plastic bag wedged in the reeds, or an Osprey flying overhead with a balloon tied to its foot totally blows the vibe and kills the dream everyone is chasing when they spend $5000 for a week in an assumed paradise with their friends and family. Again, I don’t fault the author of this letter. It is clear he has simply never seen the garbage dump which lies about 1/4 mile from his door. It is only just occurring to me that a lot of people haven’t, or if they have, maybe they don’t recognize the path we’re on, locally, and where it is heading, locally. Osprey are known as an “Indicator Species” because problems in the local marine environment tend to hit them first. They saved the Bay, and us, from DDT. Before we were able to completely destroy the Bay and poison ourselves, the trouble showed up in each Osprey nest. They saved us. We dodged a bullet because of their early warning. We are super lucky to have them. Today their eggs aren’t failing because of a poison we are dumping into the Bay. Instead, they are being choked, strangled, hung, and suffocated by plastics. That’s probably their biggest problem with regards to us. They are indicating to us where we are headed. They are screaming to us: “You are choking the Bay and strangling yourselves!” If you believe the Osprey, plastic is the DDT of our generation. Had I never had the good fortune of meeting Ben Wurst The Osprey Hero, and getting to join him on various adventures around the Bay, I’d be saying all the same stuff I keep hearing about the ban… “They are trying to control us,” and “they are killing jobs,” and “it doesn’t make a difference,” and “the great garbage patch in the Pacific comes from China,” and so on. I’d be blissfully oblivious. I never saw the true Bay until Ben showed me. An Osprey nest check is like a utility worker checking your meter. It is disruptive, and you have to get in and out real fast. While doing this, despite the tight time frame, Ben demands you grab any trash you can and bring it back to the boat. Sadly, it is getting to the point where even just grabbing the plastic trash right in front of you winds up being more than the boat can manage on any given day in our Bay. It’s sad, it’s gross, and it is getting worse. Self interest alone should be enough to motivate us. No need to go global, no need to get abstract. Forget the great Pacific garbage patch for now. We have our own garbage patch right here and it is a huge threat to the local economy and way of life. And importantly, from my experience, single-use bags are an actual, local problem; not just a symbolic issue of the greater problem of plastics. 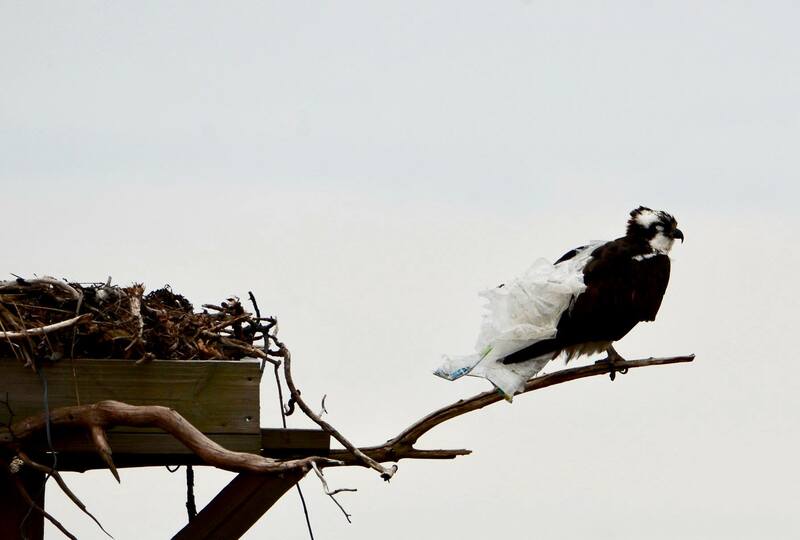 Single use bags degrade quickly, so we know the ones we pull out Osprey nests and remove from baby Osprey are coming from our own neighborhood. They are too easily carried by the wind. Styrofoam is bad too, mostly because it breaks down into small, light, durable pieces. Marine rope and fishing line are real issues too, as are balloons and their strings. To me, ballons and single use plastic bags are no brainers to try to get rid of. They are pretty stupid, and easily replaced by alternatives which don’t muck up the Island. Styrofoam, synthetic boat rope, plastic water bottles, fishing line… these things I’m more sympathetic to. At least they have some true utility. I’m willing to go down in a plastic ship if that’s what everyone wants to do. I’m not fussy. But before we choose our path, I wanted to bring to the conversation that yes, plastic is a very local issue, and that yes, single use plastic bags are part of our local problem, and that yes, getting rid of them would be extremely helpful to the local economy. I feel these facts are being missed by too many people, simply because they don’t get to spend time in the marsh and up close with our Osprey. And lastly, I’ll make a political suggestion even though it is not my forte: let’s not ban the bags; we should tax them. $1 a bag. Use should plummet. And those willing to pay can fund the good people like Ben Wurst who have to spend the whole season picking our nasty, slimy, single use plastic bags out of the reeds and off of dead Osprey so people will continue to believe that our Island is a paradise worth escaping to. EDITOR’S NOTE: I’m as lazy and selfish as the next guy or gal, and probably more so. I don’t carry my bags nearly as often as I should. But when I do, I feel like I am doing the obvious, logical, smart, and kind thing. When I don’t, I feel kind of like a loser. I personally pray for a ban because it would force my lazy hand! It would be similar to how we weaned ourselves as a culture off of drunk driving. Posted in Wildlife and tagged LBI, lbi osprey, Long Beach Island, osprey, plastic. Bookmark the permalink. This is the most practical and logical thing I have read yet about the ban. Honest and well said. Thanks. That picture makes me so sad! We didn’t always have single use plastic bags available for shoppers-just need to get used to not having them again. Go back to brown paper grocery bags or bring your own reusable. Logic should win out if people like the sandpaper author – think it through instead of complaining. The Osprey in the picture with the bag around it’s neck is free of that bag! Between his non stop shredding and the help of his mate he was able to free himself. He immediately brought two more plastic bags to the nest. Though we are weary of our nasty weather, the wind has blown both bags off the stand. Hoping he doesn’t bring more of the same after the weather blows thru today. Beautifully stated. This is the message people need to read. Thanks. Thanks for helping to bring more awareness to this very local issue. I hope you’ll write to the editor of the sandpaper too! Imposing a fee for the use of bags is definitely the best way to go. Maybe some of that $ could be used to buy reusable bags for those who can’t afford them and funding watershed cleanups. Banning plastic bags in Los Angeles had a huge and immediate impact, both at the beaches and further inland. We need to keep fighting the good fight. Yes, it’s political will that is needed here, because a percentage of people will never comply. Walmart at least takes bags in to recycle (regardless of where you got the bag), but again, a percentage of people will not even do that. For the good of the country, and the neighboring oceans, Federal policy is needed. Ban the bags by a certain date (say a year from now), and the rush to be innovative and develop a solution will begin immediately. Thanks, Jim! I urge you to please send this along with the pix to The SandPaper! Photos like this one of the poor osprey should accompany any signs announcing a plastic bag ban. There are no good reasons to choose single use plastic bags. Even for people who reuse them as garbage bags- so much plastic packaging is already in circulation, start reusing potato chip and bread bags, plastic pouches from your Amazon purchases! Well said. Yes, please send this to the Sandpaper. Well said Jim. Anyone who disagrees with the plastic bag ban should take a few minutes and read your comments, or at the very least, look at the photograph of the osprey. Please do share with the Sandpaper! I use canvas bags often but when it comes to collecting garbage in your house…..kitchen, bathrooms then what? You can’t use non throw away for that….so I take my canvas bags to the store but usually buy more than I thought I would and end up using plastic which I then use for bathroom garbage…..any suggestions? Wonderful post, Jim. I live in Ventnor where our city government has recently passed a 5 cent single use bag fee that will go into effect in October 2018. It not as good as your township’s ban, but it is a start. I’d like to see the state of New Jersey come up with a plastic bag ban. Then perhaps we’ll see a reduction of wildlife deaths. Thank you again!